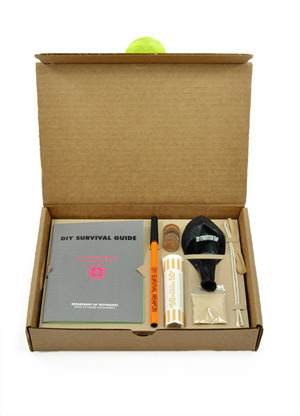 DIY Survial Kit “DIY Survival Kit” is an edition of 65 by artist Whitney Lynn designed to prepare you for the ultimate disaster. Whether an earthquake, tornado, or chemical weapon attack, Lynn provides you with the essentials: a barterable good, a weapon, and a means to keep your mind off the bleakness of your situation. Nothing in the kit, however, is complete. She gives you the materials and the inspiration, but if you are going to survive - you are going to have to Do it Yourself. Lynn’s Kit draws inspiration equally from survivalist subcultures and more left leaning do-it-yourself (DIY) movements. Lynn writes: I am interested in exploring the way survivalism stands at the extreme end of renewed interests in self-sufficiency and sustainability. I am also interested in looking at the role of aesthetics and branding in altering the way survivalism is viewed. Survivalism is born out of creative acts, but is also symptomatic of a culture of fear and isolation. The question I’m interested in is where is the line between the Unabomber’s and Thoreau’s cabin; the urban homesteader or the survivalist? Whitney Lynn is a multi-media artist who explores the messy intersections between political, military, and civilian cultures. Her work has been exhibited at venues such as Exit Art, New York; Southern Exposure, San Francisco; the Headlands Center for the Arts, Sausalito, CA; and the 1708 Gallery, Richmond, VA. She is the recipient of travel grants from the College Art Association and the Southeastern College Art Conference and her work has received critical attention from a number of publications including The New York Times, Daily Serving and Style Weekly. Born on an Air Force Base in Williams, AZ, she received her BFA in Sculpture + Extended Media from Virginia Commonwealth University and her MFA in New Genres from the San Francisco Art Institute.